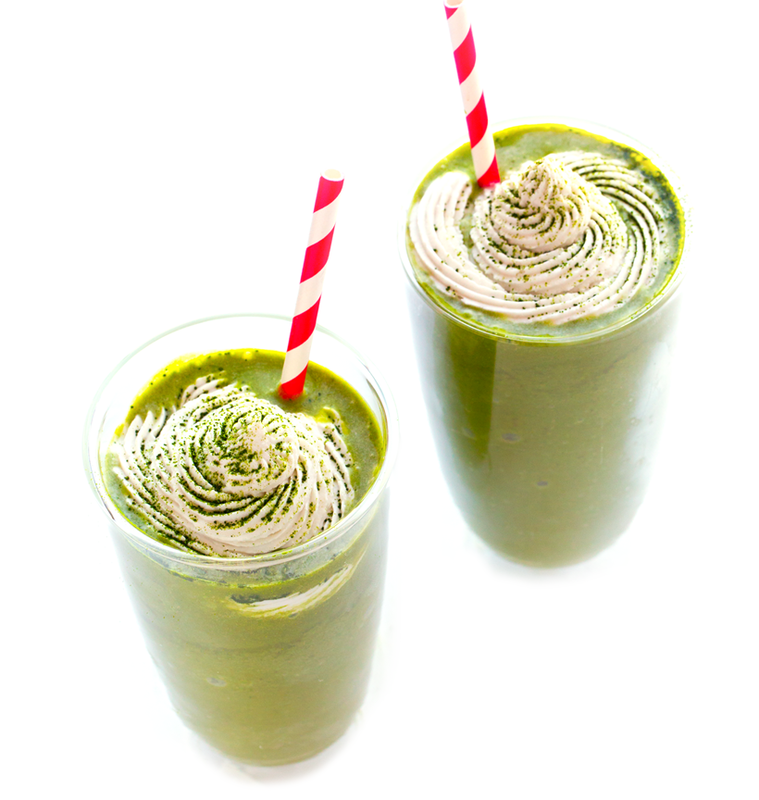 One of my favorite summer beverages is an ice cold, frothy-blended Green Tea Frappuccino. 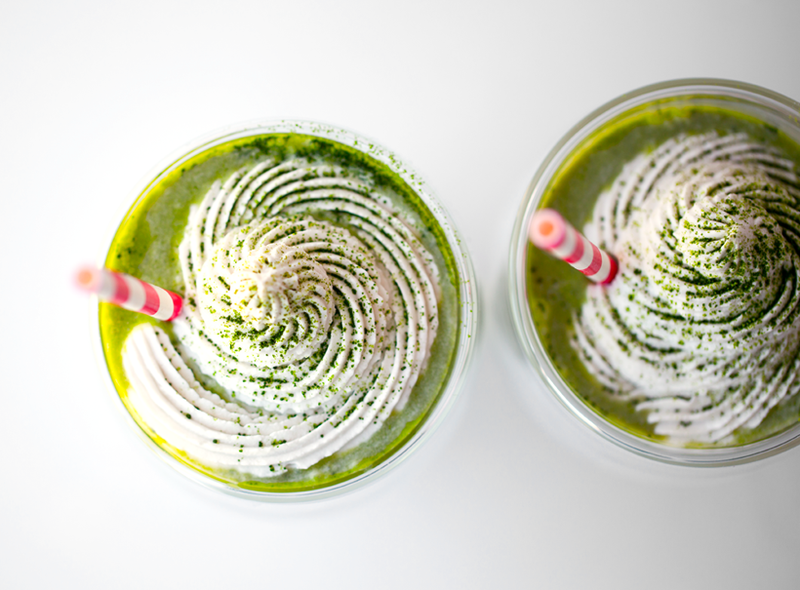 This Starbucks-inspired copycat recipe has a swirl of rich coconut cream on top and plenty of sweet matcha flavor in every sip. This summertime favorite drink is so easy to DIY, and make at home. Save some cash this summer and move your "coffee budget" into your "vacation budget." Get the recipe and a how-to video!.. Blended sweet vanilla green tea flavors - optional hint of banana if you'd like..
A swirl of freshly-made coconut whip on top. 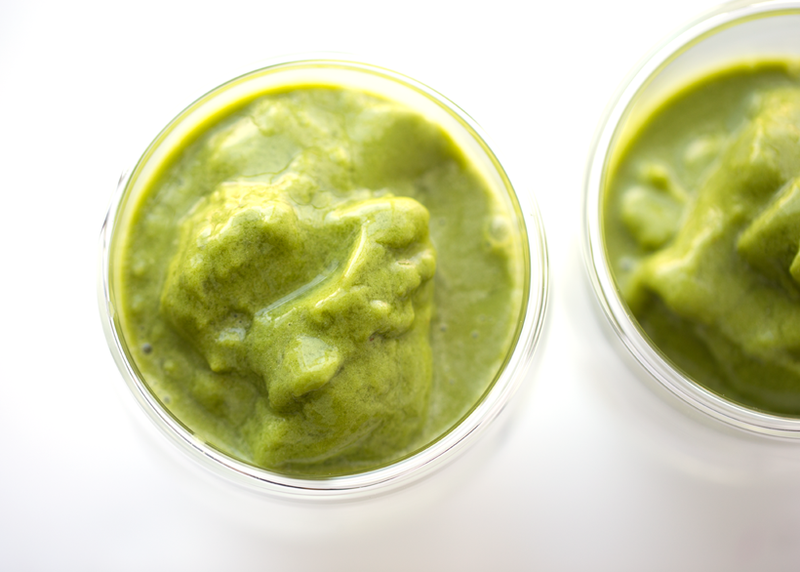 A dusting of matcha too..
For all my matcha recipes, I use my fave brand of matcha, Encha. It is the BEST I have tried and I adore the brand values and message. 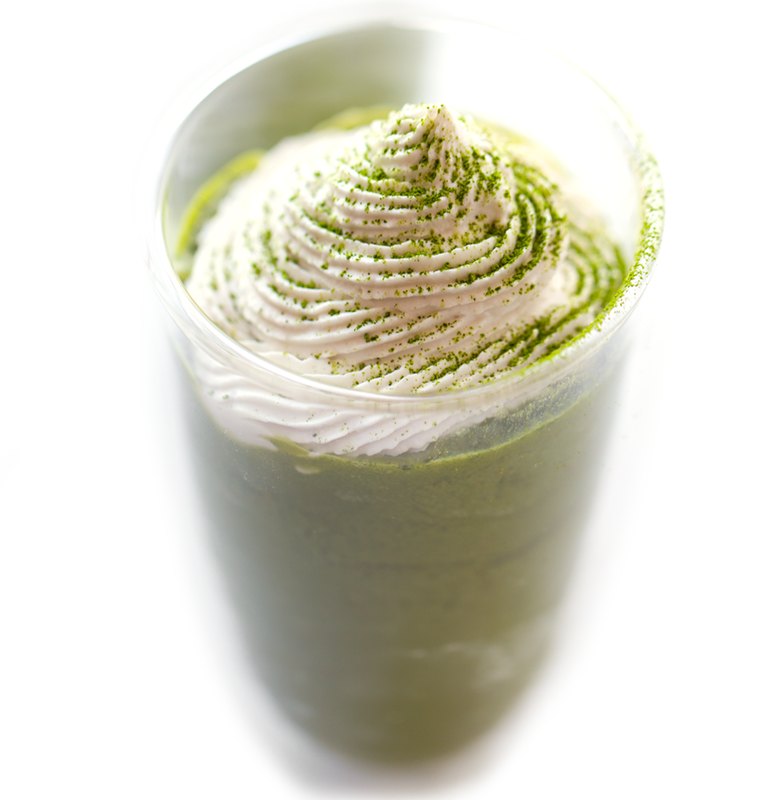 The founder of Encha is so passionate about bringing the very best, highest quality organic matcha to the world. I love the brand so much, I am even an official Encha ambassador. Buy Encha here! Said in a Jan from The Brady Bunch voice.. Matcha. Matcha. Matcha. 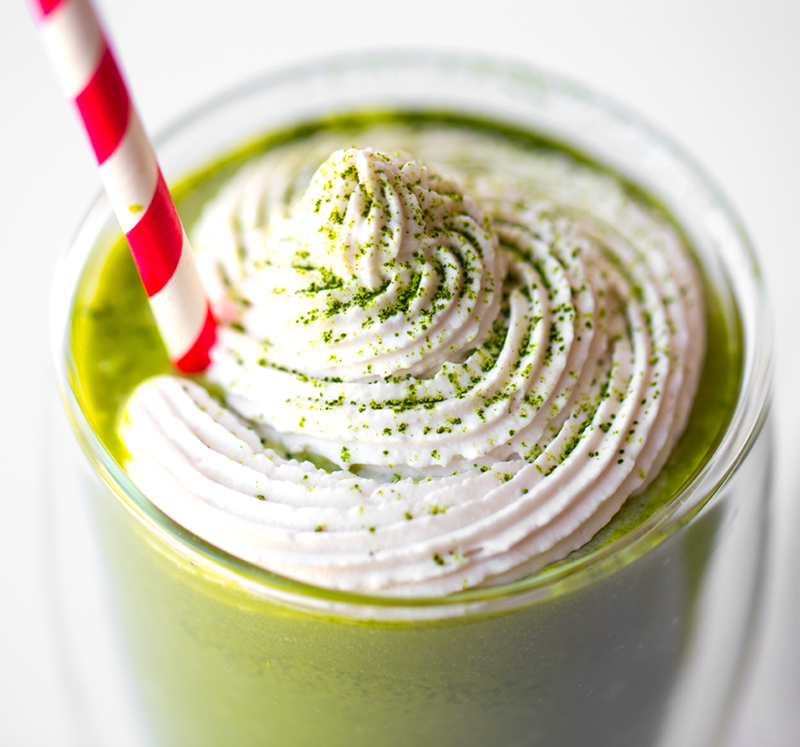 Learn all about matcha here, and download my FREE E-book with loads of tips, info and recipes! 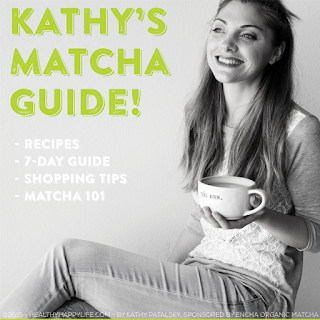 Also check out my matcha buying guide to see my matcha brand reviews. 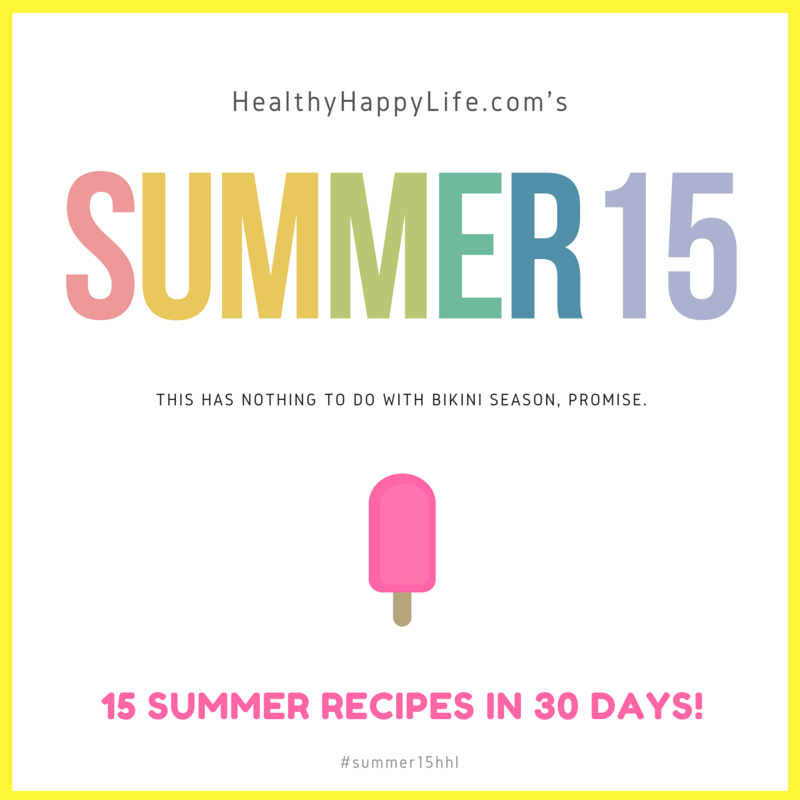 If you are following along, this is recipe number FOUR in my summer recipe series! #Summer15hhl -- 15 summer recipes in 30 days! Check out the other recipes below the recipe. 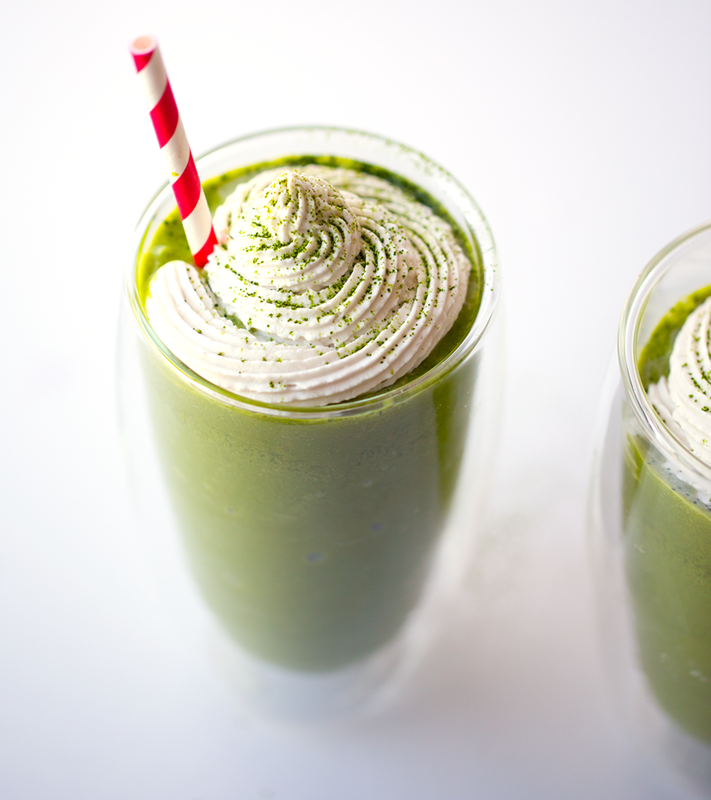 This frothy amazing green tea frappuccino is vegan and loaded with matcha antioxidants. 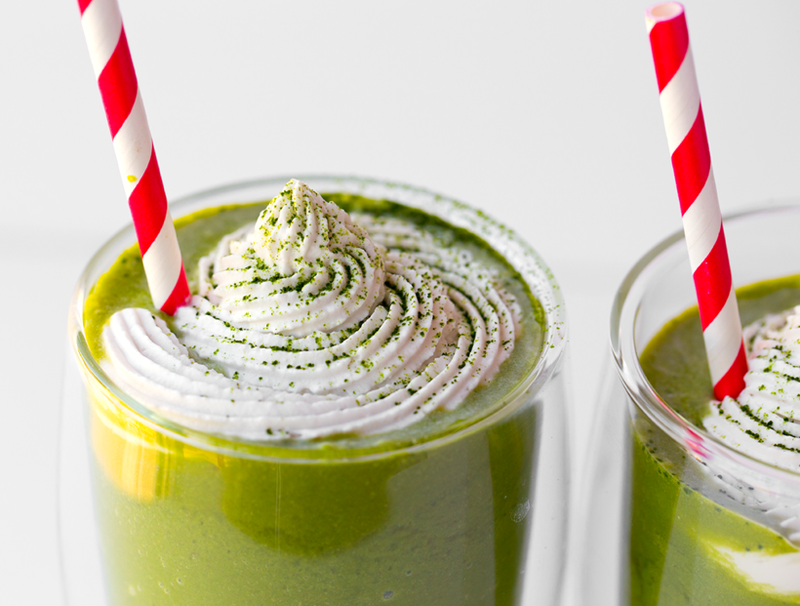 Blend your fave summer beverage at home! Coconut whip on top. 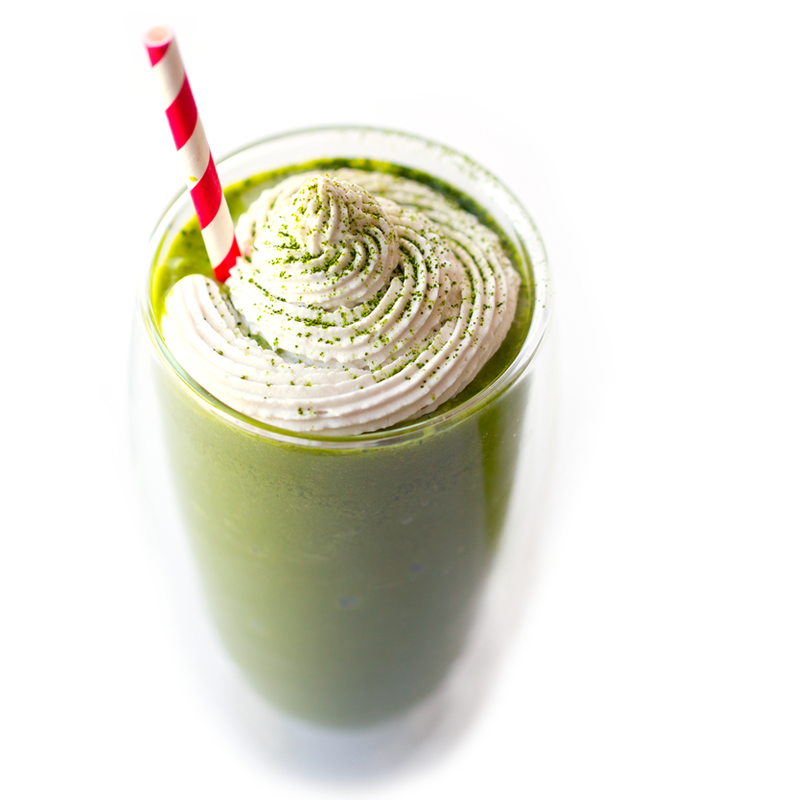 Add the non-dairy milk, optional frozen banana, vanilla, coconut sugar, matcha green tea and ice to a blender - I use my Vitamix. 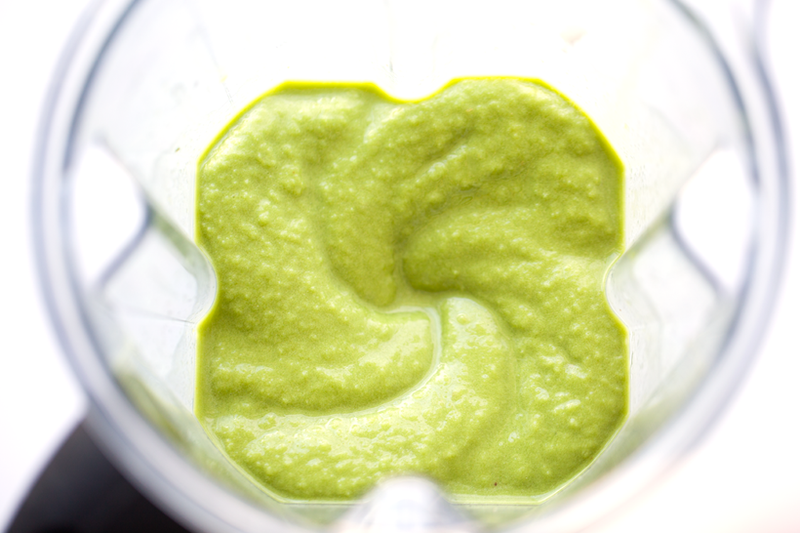 Blend from low to high until frothy and smooth. Add more ice for a frostier, thicker blend. Add more liquid for a thinner blend. Finish with a swirl of coconut whip. I use a frosting bag to create the pretty swirl shape. Tip: Chill the coconut whip in the bag, in the fridge for 5-10 minutes before swirling on top. This helps the whip keep its shape. Top with a dusting of matcha.